Just 250 metres from the sea, Oleandri Resort Paestum is set next to a fragrant pine wood, 2 km from the archaelogical site of Paestum and the train station. All air-conditioned rooms and apartments come with a balcony or patio. With a large outdoor pool, a hot tub and children's play area, Oleandri Resort is set in 30,000 m² of private parkland. The private beach is furnished with sun loungers and parasols. With modern décor, all accommodation has cool tiled floors. Rooms come with a private bathroom, while apartments include a kitchenette and comfortable lounge area. Wi-Fi is free in all rooms and in some public areas such as the restaurant, reception and swimming pool. Breakfast is buffet style, with croissants, cakes and cappuccino coffee. The restaurant serves Mediterranean cuisine including local specialities such as artichokes, buffalo mozzarella and homemade pasta. Entertainment is offered throughout the day in summer months. Historic Agropoli is 9.5 km away, and it is a 1-hour drive to Salerno. 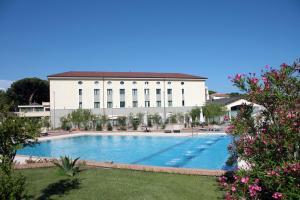 When would you like to stay at Oleandri Resort Paestum ? Located next to the swimming pool, the beach and the restaurant, this modern room features terracotta or ceramic floors, a small balcony and an LCD TV. The private bathroom has a bath.Please specify bed preference when booking. Featuring a balcony with table and chairs, this air-conditioned room has modern furnishings and satellite TV.Some rooms are located on the first floor of a building with no lift. Offering extra space, this elegant room is located in a quiet part of the resort, surrounded by olive groves. It comes with a small terrace and a bathroom decorated with traditional Vietri ceramic tiles. This room offers 2 46'' flat-screen TVs, a separate living area, and air conditioning. The private bathroom includes a hairdryer. The private bathroom offers a walk-in shower. Featuring a patio, this ground-floor apartment has a kitchen and seating area. Offering a patio, this ground-floor apartment features a satellite TV and tile/marble floor. Please note from 21 May to 25 September 1 parasol, 2 sun loungers and a beach chair per apartment/room are included at the beach. The outdoor pool is open from 25 March to 15 October, weather permitting. Entertainment is provided from 21 May until 10 September. The mini club is available for children from 3 to 12 years of age from 21 May until 10 September. 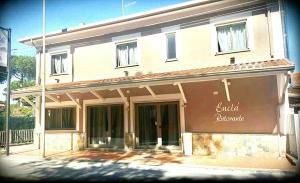 Each day we'll check prices and send you an email for your selected dates at Oleandri Resort Paestum. If you don't have specific dates but would like to check prices for say next weekend or say next month we can check the price too. Click to write a review and share your experience of Oleandri Resort Paestum with other travellers.